Three levels of automation to get you started immediately while being ready to handle the most complex problems. Automate routine tasks quickly and easily. James, Vera and Megan come pre-built with skills to handle dozens of common tasks like password resets, W-4 updates. Create automated processes by developing custom skills. Harness our Virtual People’s inbuilt AI, BPM, and RPA capabilities through our platform. 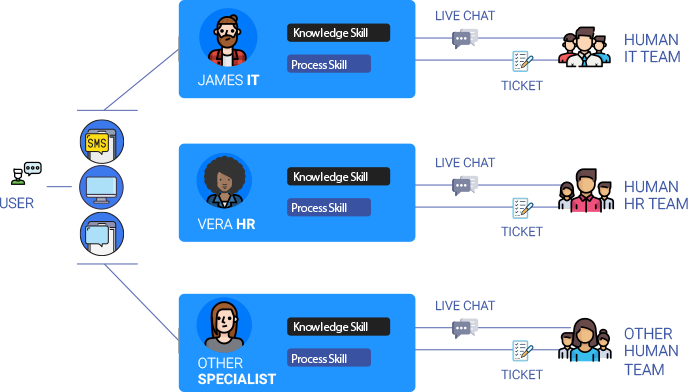 Our Virtual People are cognitive agents who come ready to handle user needs from intake to action. Powered by the latest in AI and Cognitive Automation technologies, they are designed to TALK-THINK-ACT. We're converting candidates to employee more quickly.